education that would be comparable to the best among nation and competitive in the education world market. The first step towards the goal is a K+12 basis education for all. this possible. Our Board of Trustees Chair, Senator Ed Angara and our President(yours truly)became, respectively, the Chair of the Senate Committee on Education, Arts and Culture(CEAC) and the House Committee on the Basic Education and Culture, the key congressional bodies that will act on national education policies. Committee of Science and Technology Education as well as their membership in other key committees(such as agriculture, fisheries, food, environment, culture, among others), the role and responsibility of education, especially in matters pertaining to the curriculum, will likely be raised and resolved. took the initiative in organizing and managing two Curricular Summits, hosted by FUSE as its the Learning Center for Teachers (LCT) premises. 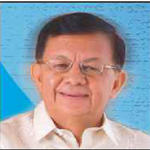 Also, in his own right as Columnist on education (Philippine Star) and as former DepEd Undersecretary, he is a member of the DepEd K+ 12 Steering Committee of which Senator Angara and I are also members. Dr. Evelyn Vicencio, Dr. Milagros Ibe, Dr. Eden Kelemen, Dr. Isagani Cruz and Dr.Dionisia Rola have been asked by Senator Ed to join an ad hoc group to revisit the post-Edcom gains made and what else need to be done to improve teacher preparation and performance. Meanwhile, Dr. Ester Garcia and Dr. Paulino Tan continue to achieve in Comste, and we look to their infusing the curriculum with modern concepts and new ideas that will reinvigorate interest in science and attract more students to become scientist. The election of FUSE member, Dr. Ester Ogena of the Science Education Institute, DOST, to the presidency of the Philippine Normal University effective in january, augurs well for the future of science teaching in K+ 12. It has been a year of Change indeed! Change of Focus… As if in anticipation of reforms in education system, Fuse has decided to shift the focus on its training in 2011 from strategy to content. However, where strategy is felt by teachers and/or supervisors to be needed, Fuse will continue to respond, as, in fact, it did last January. The salary effects of the involvement of administration in training session’s attended by their teachers have persuaded FUSE to require their attendance simultaneously, albeit as a separate group with a syllabus of its own. This new approach to in-service training might evolve into a regular training design. Increased training hours…Fuse will definitely increase the number of training days in Baguio City for each training session, from three(3) to five(5) as it did in the pilot training program last October. For this reason, training will be undertaken only during the semestral and summer breaks. We will also cement our partnership with selected local governments and teacher training programs in the provinces to ensure their support and stability. 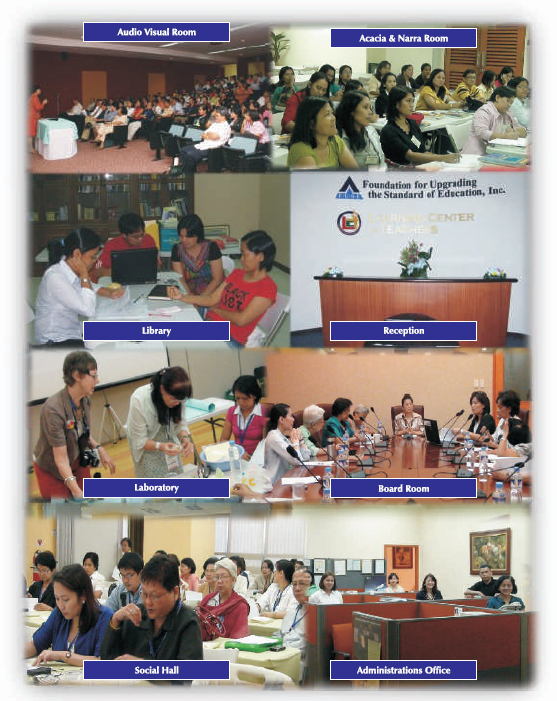 The Learning Center for Teachers(LTC) has continued to play host to sister professional organizations. Some activities of the Philippine Association for Chemistry Teachers (PACT) were once again held at the LCT, while some FUSE staff provided needed assistance. FUSE welcomed heartily its being chosen as the site of 2 Curricular Summits initiated and manage by FUSE Trustee Dr. Isagani Cruz. The Summit gathered together many of the movers and the moved, the thinkers and the doers in Philippine Education. I foresee that the group will be working, if quietly, in tandem with the Education officials. FUSE is happy to perform such role. Another constant is continuing recognition of the meaningful life of our benefactor, Lucio C. Tan. Another section of this Annual Report details why this year, he was declared an Adopted Son of General Santos City and by the Province of South Cotabato; why he was named an Outstanding Manilan; and why universities, including one from the U.S., continue to confer on him honorary degrees. That he is truly deserving is affirmed by the fact that he was honored with the Order of Lakandula(rank of Bayani)by then President Gloria Arroyo. The General Assembly has become a monthly event in our lives as FUSE members, keeping us abreast of new developments in areas of general interest. A singing goodbye to 2010 and a ringing hello to 2011! I ask all of us in Fuse to remain one and united in joining the collective response to the challenges of enabling our educational system to be a prime mover towards the liberation of our people from poverty in all its dimensions. Business tycoon Lucio C. Tan receives a citation from Mayor Pedro Acharon,Jr. (third from left) declaring him an adopted son of General Santos City. Tan, 75, was recognized for his numerous investments and social contributions to the city and its people. The tycoon was also declared an adopted son of the Province of South Cotabato during same occasion. Business tycoon Lucio Tan was guest of honor during the inauguration of the new Sta.Ana Hospital, a multi-storey, 300-bed-government medical facility in manila’s 6th District. Equipped with modern amenities like CT-Scan, brand new ultrasound and x-ray machines, heart station and complete laboratory facilities, the hospital will provide free medical services to indigent Manila residents. The hospital was built by the city government on land donated by Tan’s Tan Yan Kee Foundation. 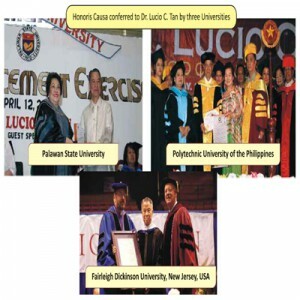 Taipan Lucio C. Tan was conferred a doctorate degree administration (honoris causa) by the Polytechnic University of the Philippines (PUP) during the state university’s commencement exercises at the World Trade Center. In his speech, Tan told the graduates that poverty is not an obstacle to a college education and stressed that hard work, discipline and prudence are necessary ingredient for success. OUTSTANDING MANILA. Dr. Lucio C. tan received a medallion and a plaque of appreciation from Manila City Mayor Alfredo Lim after for his humanitarian assistance and other contributions to the city, particularly his recent donation of a huge piece of prime real estate which became the site of the Ospital ng Sta.Ana in Manila’s 6th district. President Gloria Macapagal-Arroyo honored Dr. Lucio C. Tan with the Order of Lakandula(rank of Bayani) at the sidelines of ongoing World Expo 2010 in Shanghai, China. The Palace cited Tan for his achievements in various local industries, his contributions to the advancements of education, culture, sports, health, social welfare, research, manpower development, his support for the success of the presidential and other high-level foreign visits, his philanthropic work and corporate social responsibly practices and for his outstanding leadership in country’s business community and overseas. 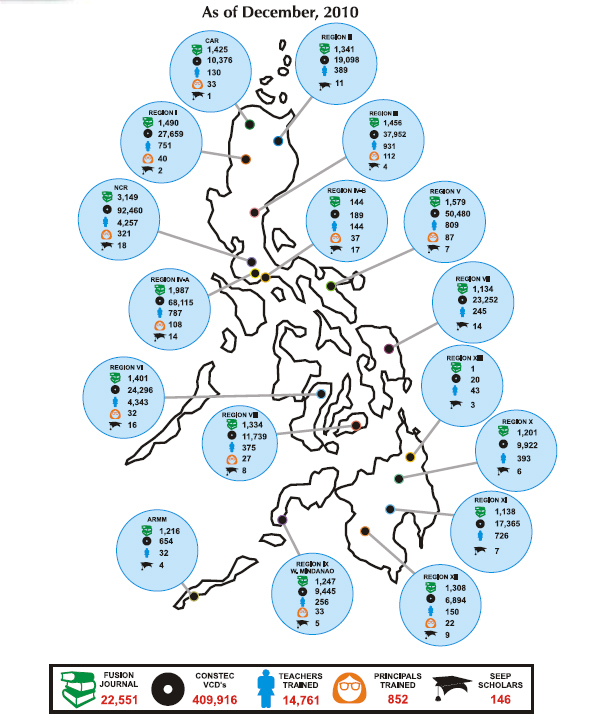 The award is one of the highest honors conferred upon a Filipino or foreign citizen. To start the year, the Training Committee conducted two-day Teacher Training Courses in five content areas, namely; Elementary Science and Health, High School English, High School Mathematics, Physics and Chemistry on 28-29 January 2010 at the Learning center for Teachers (LCT). Participants in this course where basic education teachers from member-school of the Manila Archdiocesan and Parochial Schools Association Inc. (MAPSA). MAPSA is a non-stock, non-profit association of diocesan schools of the Archdiocese of Manila. Its president is Msgr. Gerardo O. Santos, who is the immediate past president of the Catholic Educational Association (CEAP). Part of the cost of the training was shouldered by MAPSA. But the generosity of FUSE, despite its limited resources, was manifest. Each school was given training materials, handouts and a complete set of CONSTEC VCDS and TSM (Teaching Support Materials) in the five areas mentioned. The summer of 2010 will be remembered for its historic national elections. Thus, FUSE deemed it wise to put on hold its usual provincial and regional runs during the summer months. During this time, the Committee cemented its plans to shift from the two-day course, which was basically an introduction to Video-Based Learning using the CONSTEC materials, to a five-day teacher-training course focused on content. Thus, FUSE forged a partnership with the CEAP Basic Education Commission and piloted a 5-day Content Upgrading Course for Teachers of Elementary Science and Health, High School English, High School Mathematics, Physics and Chemistry. This was held on 18-22 October for Regions 1,2 and CAR at St. Louis School Center, Baguio City. The session in the five subject areas were held simultaneously. More that 130 teachers completed the training course. As always, each school was given training materials, handouts and a complete set of CONSTEC VCDS and TSM (Teaching Support Materials) in the five areas mentioned. The Opening Ceremonies on 18 October, 2010 were graced by Sister Lourdes M. Dulay, ICM and Fr. Gilbert B. Sales, CICM, CEAP Regional Directors of CAR and Region1, respectively. Sister Lourdes M. Dulay, ICM is the School Director of St. Louis School Center while Fr. Gilbert B. Sales, CICM is the President of St. Louis College, La Union. The two assured FUSE that there would be extensive echo seminars and follow-up activities so the rest of the teachers in the regions benefit from the program as well. The trainers from the FUSE Training Committee were: for Mathematics, Dr. Milagros Ile and Dr. Nympha Joaquin from the University of the Philippines College of Education; for Chemistry, Prof. Emmanuel Garcia from De La Salle University and Prof. Rachel Ramirez from the UP Integrated School; for Physics, Dr. Josefina Pabellon, formly from UP NISMED and Prof. Rhodora Angela Ferrer; for Elementary Science and Health, Dr. Raymundo Baquiran from Ateneo de Manila university and Dr. Josefina Belen and Ms.Evelyn Josue, both from UP NISMED; and for English, Prof. Marla Papango, from the Philippine Normal University. invitations for partnership for next year have been receive from region 4 led by Fr. Jun Baria, Superintendent of the Diocese of San Pablo and President of the Laguna Catholic Schools Association (LACASA) and the City Government of Urdaneta to co-sponsor this Five-Day Content Upgrading Course for Basic Education Teachers. The Nazarene Catholic School Procorpio D. Ejercito Jr.
Polytechnic Univ. of the Phil. Ina ng Buhay Catholic School Renato B. Mendoza Jr.
Saint Mary’s School of Dupax Orlando C. Castillo Jr.
Don Bosco Elem. School Edgar N. Medrano Jr.
St. Louis School Center Carlos O. Villanueva Jr.
Saint Vincent School Rosito L. Cam-ed Jr.
San Francisco High School Raymund S. Bajita Jr.
Saint Joseph College Rodolfo M. Pepe Jr.
SYCIP GORREZ VELAYO & CO.
Let us all move forward, educate our nation.